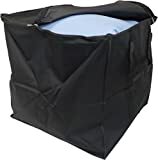 The stackable Heavy Duty Bedding Bag / Cube can store 100 Litres. We know that many customers love our reinforced 200 Litre Bedding Chest, but don’t have the room to use them in every occasion, so we created this 100 Litre version. Like the larger version, this bag has reinforced handles that go all the way underneath the bag to support the weight and ensure you can lift it when full. 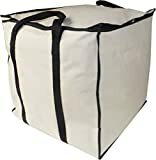 Measuring 47cm x 47cm x 47cm, this 100 litre capacity bedding bag is a cube, so you can stack one on top of the other, and store them in your wardrobe or in the loft. They are still very spacious and can handle a huge about of bedding, but they are more manageable than the 200 litre version. As with the rest of our heavy duty bedding storage, the bag is made from full 600D polyester and has a strong zip to ensure that the bag will last.